If only…I could do an unsupported headstand in the middle of the room, I thought to myself wistfully. I can kick up into headstand easily and do an unsupported headstand for five minutes – but I need a wall to kick up against. I want to go to the next step and get into a headstand without a wall to catch me, but so far, I haven’t had much luck. Coming down and resting my forehead on the floor in pose of the child to normalise my blood pressure, I thought for a moment about some of my other ‘if onlys’. I smiled to myself, still resting in child’s pose. 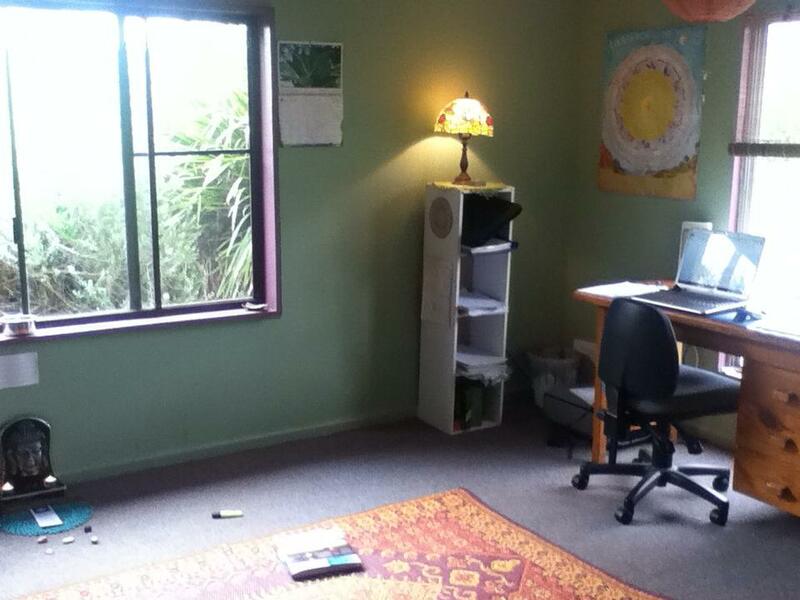 My sacred space – where I work, do yoga and regenerate. A regular home yoga practice? I’ve written about this here, there and everywhere, and in fact I blogged every day through my first 40 days of yoga. That was about 18 months ago, and I’m still doing yoga every day. Working from home? First I needed an office (thank you accidental yoga room). Then I needed internet in that office (thank you Glen for installing my router). Then I needed a job (thank you Elizabeth for sending me the link for my first online job) . I have worked for nearly a year doing social media, blogging and newsletters for a company specialising in helping wellness practitioners create successful businesses. Headstand against the wall? I wrote about that here – but let me just say that I was just as defeated and doubting about my ability to do that as I am about doing a headstand in the middle of the room now. It’s our job to come up with the what: it’s the Universe’s job to come up with the how, when and where. Don’t for God’s sake try to step out of your job description. We need to keep our desires as general as possible because we don’t have all the information, we don’t have access to the big picture. Patience and faith, people. It is not enough to sit around and wish for things. Action is the next principle. Ever heard that saying God helps those who help themselves? What this actually means is to attract Universal attention, you need to take small steps towards your dream. Does the thing you want cost money? Start saving, look for another job! Do you want a job that you aren’t qualified or experienced enough for? Sort that out – study and volunteer. Do you want to be a writer? Start a blog, go to a writers group, do a writing course. You must take action, because action creates momentum on all sorts of levels – some that you see and some that you don’t. Hang on a minute, I’ve just had an idea about the headstand. What about if I practice the technique for getting into a headstand in the middle of the room – against a wall? Hang on a minute and let me just see if that works. I’m back. It does work 🙂 For me, writing creates clarity and understanding, which then goes on to create action. If I am not clear about something, I become stuck. So, if onlys are super powerful when accompanied by patience, faith and action, huh? If only…I could get a new car (small to medium 4wd please). What do I need to do? Get more work, keep my eye out, have faith and be patient. If only…I could get a great job that I can work from or close to home, that suits my interests, skills, experience and passions, earn enough money to get what I need and fit in with my family. What do I need to do? Apply for jobs that suit my criteria, make sure my experience and qualifications are up to date, be patient, keep the faith. If only…we could have our house extension completely finished within the next 12 months. What do I need to do? Earn more money, save hard, be patient, keep the faith. If only…this gorgeous book idea that is germinating in my heart and mind will become a reality! What do I need to do? Research, get my ideas together, write, be patient, keep the faith. What are some of your ‘if onlys’ – and how do make your dreams come true? Way to go lady!! I LOVED how all your “if only(s)” found themselves completed! What a great challenge and with some good advise to go along with it!